The Clean-Roll door is the only UL-listed high-speed roll door designed specifically to meet USDA, FDA, NSF and ISO standards. Designed to allow complete wash-down with numerous sanitary features for applications requiring absolute cleanliness while providing low-maintenance and energy savings. 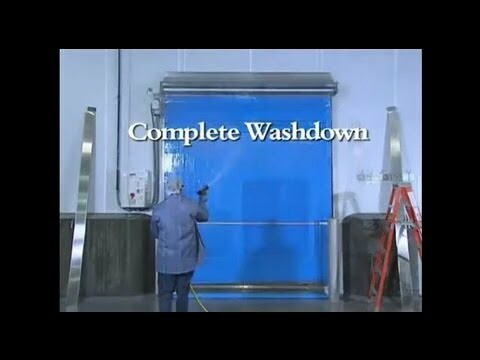 Ideal for USDA, FDA and CFIA applications, the Clean-Roll door can be built up to 12’ wide x 12’ high. Engineered to meet USDA hygienic standards for meat, poultry, dairy and seafood applications. Designed for complete wash-down while innovative engineering prevents liquid contaminants from dripping into the traffic pathway, improving productivity. USDA/FDA-compliant design virtually eliminates potential sites for germ manifestation. High-speed operation, up to 50 inches per second, helps maintain a safe, controlled environment. Drip-Safe™ guard is an automatic pneumatic drip-catch tray that moves under the roll drum when the door opens. This enables fragile food cargoes to safely move through the doorway.